The 42-year-old actor wants people to enjoy his films and he admits the pressure makes him act weird when he's promoting his projects. During an appearance on 'The Late Show with David Letterman', he said: "I just feel pressured to try to make good movies. For me, a weird thing happens where I get this kind of weird, almost Tourette's thing, where I just immediately think of the exact wrong thing to say to try get people to see the movie." To give an example, David asked him what his new science fiction movie 'Elysium' is about. To which Matt jokingly responded: "Well how much do you know about fracking ... It's a science fiction fracking movie." 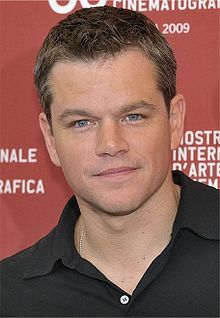 Matt's next project is 'The Monuments Men', a World War II movie directed by his friend George Clooney which also stars one of the Oscar winner's heroes Bill Murray. He said: "[Bill] and George became friends about five or six years ago and George really just put this whole group together. Bill's awesome in the movie; he's really great. "George really was one of the best directors I've ever worked with and I've worked with a lot of directors." Matt quipped George, 52, is so talented it's not fair to his peers, adding: "It's so frustrating. Honest to God, it's like God said, maybe this once I'm just gonna keep going and give him more. Sure he's an actor, a writer and a producer, he's a director - yeah why not? It's obscene."